A volunteer unloads Razor kick scooters at Razor U.S.A. and San Diego Veterans Coalition’s Family Life Action Group distribution of 600 Razor kick scooters and helmets to San Diego veteran families. Photo courtesy of Razor U.S.A.
SAN DIEGO–Razor USA and the San Diego Veterans Coalition’s (SDVC) Family Life Action Group (FLAG) Tuesday distributed 600 Razor kick scooters and helmets for San Diego veteran families. 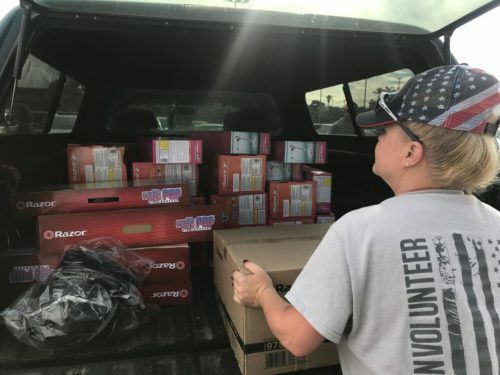 This distribution is the official kick-off to Razor’s First Wheels Program and comes in time for the holidays to provide many children an opportunity to enjoy active play with their friends and family. “Razor believes that adopting active play early-on leads to a healthy, active lifestyle and we are dedicated to working with organizations like the SDVC to provide play and fun for kids of all ages,” said Erin Bitar, Vice President of Global Marketing at Razor USA. “It is an honor for us to partner with the Veterans Coalition today to help give 600 kids their first set of wheels.” The scooters will be given to families of veterans who have departed from military service this past year or are in the last several months prior to leaving active duty. Attending the day’s event were veteran families and San Diego service organizations, including Vets’ Community Connections, Veterans Village of San Diego, Amvets Post 1775, Wounded Warrior Project, Easter Seals, Support the Enlisted Project, Courage to Call, Women Veterans Network, American Legion Post 434, Us4Warriors, and the University of San Diego’s Military and Veterans Program. These organizations work directly with veterans throughout the San Diego area and have identified the veterans within their communities who will receive the kick scooters. “Leaving the military can be incredibly stressful, and can put an extra strain on the families’ finances, especially during the Holidays. This project hopes to relieve some of the stress by providing parents with a new Razor scooter and helmet to give to their child. Thank you, Razor USA for making this possible!” said Ron Stark, President of SDVC.